Do you ever have a cosmetic or skincare that you love to use it at the first few week (or more), then you kinda dislike it and turn out you really really dislike it? I'd like to say 'hate' but thought the word is too harsh. I first learned about BB cream around 2009 and boy, how excited was I to buy it! 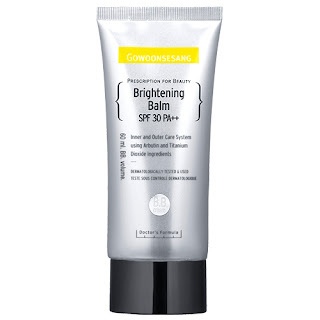 After looking through many reviews and stores that sell cosmetic product in KKcity, I finally set my eyes and bought the Dr. G (Gowoonsesang) Brightening Balm SPF 30 PA++. What is BB cream? Click this link to Wikipedia. Main promoted/key/active ingredients: Arbutin, Titanium Dioxide, Hydrophilic & Lipophilic ingredients. 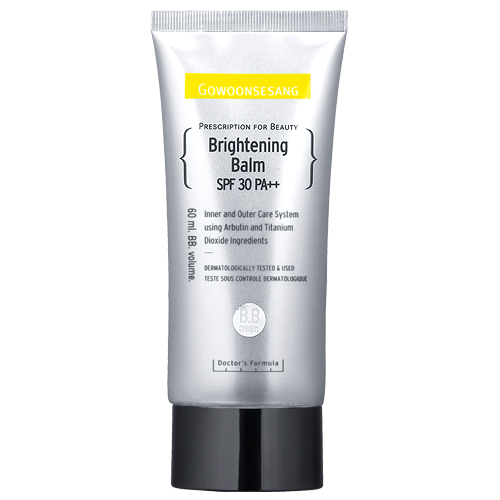 Claims: (Taken from Dr. G Website)It is BB cream that serves as whitening essence, makeup base of controlling sebum, and foundation of light after-usage-feeling. As it contains the ingredients that protects a skin from UV light and various botanical elements, it is highly effective in hydrating and soothing a skin. What it says on the tube: (BACK) Gowoonsesang applied special skin moisturization system using 2 ingredients, hydrophilic and lipophilic ingredients. It focused inner and outer in human skin. Inner careis for the water holding effect using Hydrophilic ingredient. outer care is for the water preventing effect using lipophilic ingredient. Ingredients: There are no ingredient list on the tube or on the box; but still point out some of the key/active ingredients. Pricing: I would say RM98 is expensive. However, considering that you only need a pea size of the BB cream for the whole face and neck, RM98 is a quite affordable investment. If use regularly, I think a tube can last for 2 years or probably more. Depends on your usage. Application: On first application, I felt like I put on nothing on the skin. The BB cream becomes dry and powdery after it blends on the skin. My face looked matte. Most of my acne scars (not including those big dark ones) seems gone! Or at least the appearance is less noticeable. Those pores diminished! But as time goes by before noon, my face became dewy. The sight is still okay though. Then, on the later of the day, around 2pm/3pm, my face become too "dewy" for my liking. I can feel like there is a layer of "something" (or rather, oil) on my skin. Comes with only ONE shade. If you have very fair skin, this might makes you even paler because it has grey tint. I am medium fair-beige skin tone but have no problem with it as it oxidizes few minutes after application. I didn't get any breakouts on the first few weeks when I use the BB cream. And I wasn't that aware of when I started to get acne here and there. But I continue using the BB cream because it works well covering the redness of the acne; made my skin looked I don't have acne. As I kept using it, my acne became worse. I even bought Biore Oil Cleanser to wash it off, just to make sure I remove it properly. But they kept popping. Especially around my cheeks, nose, chin, jaw and neck. And after my skin developed from oily to combination, I was unable to put on this product anymore because it made those dry patchy skin looks obvious. I guess dry skin peeps can't use this; unless you exfoliate with mild exfoliator and put on tons of moisturizers. ~ Mild coverage. It covers redness, small/light scars, dullness, pigmentation and minimize pores. ~ Build-able. Just add/dab some more to conceal the problematic area. ~ I can honestly say it had lightened the slight pigmentation and discoloration that started to form on my face. ~ SPF 30 PA++, just enough protection! ~ The nozzle is good enough to control the amount I need. ~ I got breakouts everytime I use it. Too bad! ~ It do not actually control the oil/shine on my face all day. My face was "shining" by afternoon. ~ I can't use it anymore as my skin developed to combination. ~ It does not feel heavy on the first application. But as time goes by, I can feel like there is a layer of barrier on my skin. And I feel uncomfortable. ~ There was a leak on my tube which made me think that the tube is not designed/made well enough? ~ The grey-ish tint! A friend said that it probably for light reflective effect. I'm not sure. ~ No other shade to choose from. But then again, not much of a problem for me because it oxidizes few minutes after application. What mine looks like. See the pool of BB cream? Will I purchase it again? No, I won't. I still like the BB cream for all the good thing it made my skin look. But I don't want to risk to get more acne. Yikes! I'll give this product 2.5 out of 5 stars. That's still quite high because it does do some nice result on my face. I just dislike it when acne pop out. Oil controlling claim is a fail too. Not to forget that it only have ONE color and it got some grey tint in it. However, it might suitable for normal skin folks.